In 2013 a scathing documentary was released called “Blackfish” about how Sea World is horrible for keeping Killer Whales in captivity for entertainment purposes. And Sea World continues to deal with backlash from the film from animal rights activists to this day. You would think they would be the masters of handling negative commentary by this point, but a quick glance at their social strategy reveals that they are swept into the undercurrent of this anger and they are drowning. The first I heard of “Blackfish” was last week. Sea World launched an “#AskSeaWorld” misinformation campaign on social, where the public was invited to ask questions and they would answer them on their website. And so they threw their social open to every animal rights activist ever to be social and said “Come on in!” News organizations had a heyday talking about how animal rights activists hijacked the #AskSeaWorld hashtag, like “How many orcas have died in your tanks?” and “Why don’t any of your Shamu stuffed animals have rake marks or collapsed dorsal fins?” Ouch. But the media may have been willing to overlook the trending #AskSeaWorld topic if Sea World’s response wasn’t so abysmal. 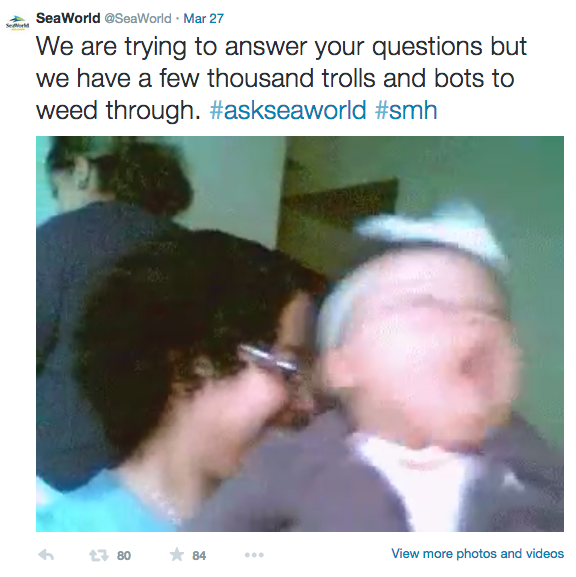 Just taking a look at the @SeaWorld twitter handle, you see as many links to their planned Ask and Answer response page as you see very immature, babyish, totally angry and unwitty memes. Really, Sea World? You opened the flood gates and didn’t expect this? You felt the undercurrent of anger so much that you created the campaign to speak to the misinformation. You must have known that the haters were gonna hate. 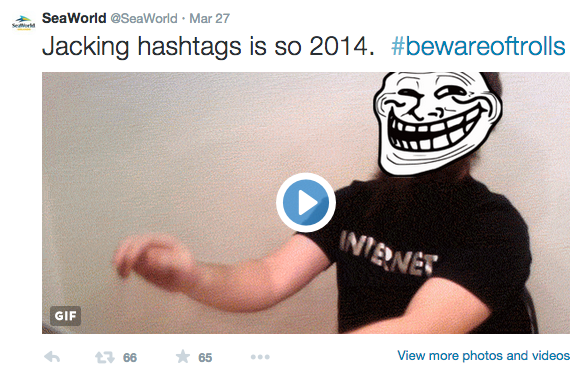 And yet, I have to believe that Sea World didn’t expect it, because I cannot imagine a social media team sitting in a planning meeting, digging around for these memes, and deciding to call the angry people “bots and trolls.” They were somehow, idiotically, caught on the defensive. So my first suggestion is to consider all the possible responses from the people, lovers and haters alike, in the planning process. Here, we see Sea World caught off balance, crushed backward by a wave they apparently weren’t expecting. But if, in the planning process, they had talked through and mapped out everything that might happen, they might have had their feet set. They might have dug in, leaned into the wave as it came and handled it with dignity. They should have had a plan: If the “trolls and bots” (to use Sea World’s moronic words) take over this hashtag, here is what we’re going to do. Sometimes, though, you are caught on the defensive, despite the best planning. Sometimes the wave comes (and I imagine the Big Kahuna an animal rights group can unleash could get quite tsunami-ish), and you just can’t prepare enough. (But let’s be real, you can prepare enough to rule out the #smh (shaking my head) hashtag and the meme troll face at the computer.) And if that happens—if you are crushed by an unexpected wave mid-campaign, you sit with a team of people. You make coffee, you share gratitudes and positive things that have happened in the campaign, and then you have a calm discussion about how best to deal with the gallon of sand and salt water you just swallowed. And here is how that meeting will go. You will laugh at (and rule out) the childish, angry responses that will feel good until the moment you hit send and it’s out there in the world. You will think of and write down kind responses that still allow you to maintain respect and dignity. And you consider the possibility of what is sometimes the best response—to do nothing. Then, you will imagine all of the people in the world—the “bots and trolls” as you will jokingly call them in the meeting and no where else, the people in the room you are in, and the general public. And then, you will consider how many of each kind of people there are. And then, as a final step, you will consider how the largest group of the three will view your response. Which brings me back to my personal experience with this epic marketing failure. As I said earlier, the first time I heard of Blackfish was last week. 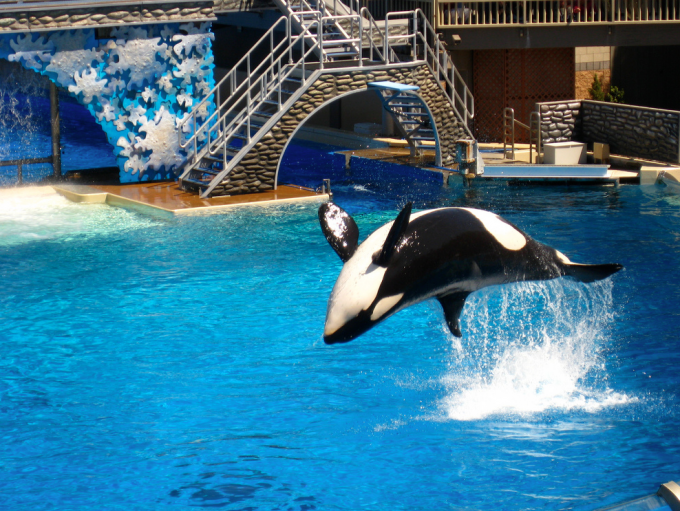 Prior to last week, I thought I might one day visit Florida, and if I did so, I’d take my kids to Sea World and reminisce about my childhood love of Free Willy. But now, because of the fish-out-of-water response of the Sea World marketing team, I am not so sure. My attention has been called to the haters, and I will have to look into and measure their complaints rather than making a blissfully ignorant visit. So maybe I can’t blame the Sea World marketing team for the epic failure to perform last week. It’s clear that they are in the wrong profession. Perhaps a change of vocation is in order. I hear “knowyourmeme.com” is hiring. For more marketing tips and news, join our eList.